Peru is a representative democratic republic divided into 25 regions. 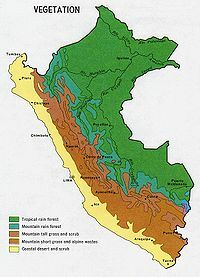 Its geography varies from the arid plains of the Pacific coast to the peaks of the Andes mountains and the tropical forests of the Amazon Basin. It is a developing country with a high Human Development Index score and a poverty level around 36%. Its main economic activities include agriculture, fishing, mining, and manufacturing of products such as textiles.